February 04, 2010. By Michelle Baltazar. Feb 2010. Mondayitis wearing you down? There’s a dance class near Central Station that will get you feeling more festive on the worst day of the week, writes MICHELLE BALTAZAR. 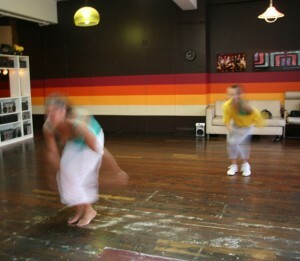 Dance Studio 101 is one of Sydney’s best-kept secrets in dance. It hosts a dance class called Caribbean Fyah every Monday night, 7pm, at an uber-cool dance studio minutes away from Central Station. The class features a dance called soca, which is short for Soul Calypso, a musical genre from the Caribbean islands of Trinidad & Tobago. Think reggae dancing on steroids – with a lot of jumping, a lot of booty-shaking and a lot of heart. Tamara Vahn, who hails from Trini herself, teaches the class and gets a 10 out of 10 in my books. I’ve attended her classes many times and am very impressed with the way she breaks the dance steps into easily manageable chunks. And with the world-famous Trinidad & Tobago Carnivale happening this month, a Caribbean class with Tamara can get you the same festival feeling without the hassles of getting stuck in a busy airport. Tamara’s class is also a great way to discover the studio itself, which also teaches dancehall, tango and Brazilian Samba. Or you could get your friends together to attend a Solid Gold 80’s dance course, where veryone gets to sip champagne, dress up in 80’s leotards and work on a big routine at the end (think Thriller or Dirty Dancing). Whatever takes your fancy, there’s a dance class that will fit your style. But when you wake up on a Monday and feel like stretching that weekend vibe, you should check out Tamara’s Caribbean Fyah! Why do you love soca so much? It’s in me veins. But seriously, it is. And it’s such a free spirit type of music and dance. There’s no posturing. It’s not about thinking “I’m all that” or “I’m the best”. It’s all about having fun no matter what your age, nationality, body shape or size and whether you’re a man or a woman. It’s just about being you and loving the moment. For the fitness nuts out there, soca can be high-energy. Do you burn more kilojoules dancing soca in 45min than interval running for the same time? The byproduct of doing soca dance is the sweat! You just don’t notice…you’re havin’ too much fun doing it. What are the three dance moves that people are guaranteed to learn if they attend your class? A ‘wine’, a ‘juk’ and a ‘get on bad’!